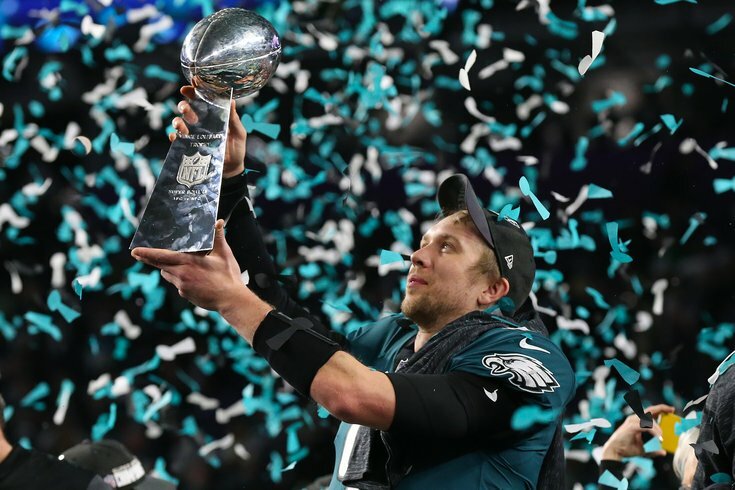 Philadelphia Eagles quarterback Nick Foles hoists the Lombardi Trophy after beating the New England Patriots in Super Bowl LII. The Philadelphia Eagles will head to Foxborough on Thursday to take on the New England Patriots in their second preseason game, their first meeting since the Eagles defeated New England in Super Bowl LII. The timing could not have been more perfect for the deployment of the much-anticipated Eagles billboard on Route 1 outside Gillette Stadium. It is a taunt for the ages, so marvelous that the Boston Globe wrote an article about how Philly fans just can't stop gloating—self-unawareness at its finest. As a refresher, this billboard came from a bet between Gina Lewis, an Eagles fan living in Boston, and her Patriots fan co-worker. Months after the Super Bowl, Lewis predicted she could still generate waves on social media simply by asking Eagles fans to upstage her co-worker for the right to put up a billboard in the Boston area. Patriots fans, as seen in this segment from CBS Boston, were both upset and mildly confused. The billboard, designed by local sports artist Jordan Spector, was funded through a combination of crowdfunding and $500 from Lewis' defeated co-worker. A large portion of the money raised on GoFundMe will support Eagles quarterback Carson Wentz's AO1 Foundation. New England fans driving to Foxborough should get used to it for the next month and let it sink in one more time. Here's a little salt in the meantime.